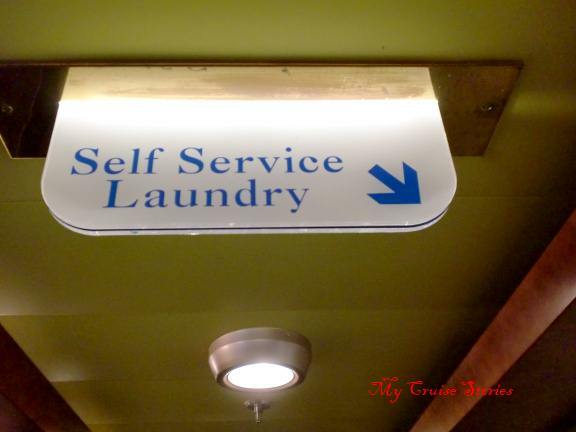 Can I do my own laundry on a cruise? Passengers-to-be often wonder about that in these days of limited luggage for airline travel. Particularly when taking longer voyages. Cruise lines do offer laundry service where the crew will do the passenger’s laundry – for a fee, and not a small one either. Most ships have a tiny clothesline in the shower so a bit of handwashing can hang there – if the line space is not already taken up with swimsuits drying from a trip to the beach, a dip in the pool or hot tub, or perhaps an afternoon’s fun on the waterslides. For short cruises most people can pack enough clothes to meet their needs, but on longer voyages clean clothes may run out partway through. Luckily for us we have taken our longest trips on Carnival. We took a back-to-back Eastern & Western Caribbean cruise on the Liberty, and a transatlantic voyage on the Breeze. On both these vacations we made use of the laundrette. 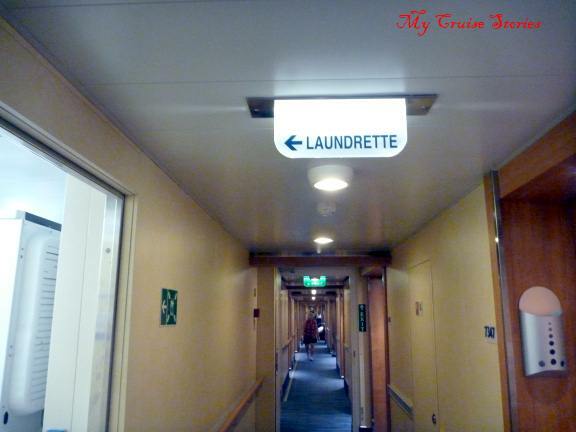 Carnival has laundrettes on all of their ships, something their passengers truly appreciate. On the Liberty each passenger deck had its own laundrette with several coin-operated washers and dryers each. Only one washer worked on our deck, but the deck above housed most of the suites. Suite guests tended to send laundry out to the crew, plus their washers all worked, so I never had any trouble finding a washer open one floor up. On the Breeze, Carnival’s newest ship, only a few decks had full laundrettes with washers and dryers operated not by coins, but by the sail & sign card that works as room key and shipboard credit card. The rest of the decks just had ironing rooms. On a transatlantic voyage this tended to cause a back-up of people waiting for washing machines, especially since they locked the laundrettes up at night. Our deck had a full laundrette, poorly located next to the suites where the guests were least likely to use them and most likely to complain about the noise. And complain they did, which resulted in the laundrettes having shorter hours and longer lines…..and more noise because people waiting out in the hall for the door to open in the morning tend to talk. I only hope this reduction in laundry facilities is an not indicator that Carnival has plans of phasing them out like most of the rest of the cruise lines have done. 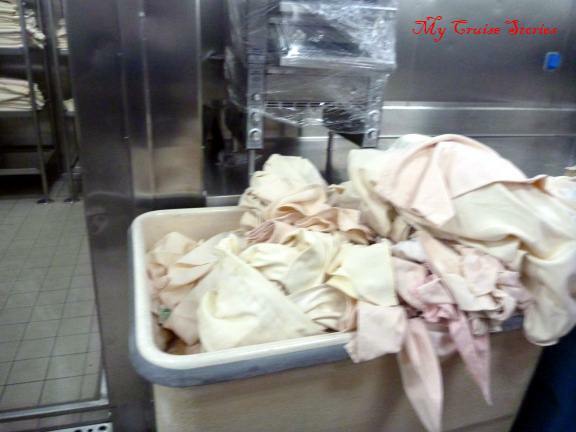 Judging by the amount of people who use them, a large percentage of the passengers appreciate having the option to do their own laundry during the cruise rather than paying the exorbitant fees to have the crew wash it for them. We greatly appreciated the laundrette on the Breeze in spite of having to wait to use it. I recently sailed on the Holland America Veendam and was rather surprised to see that it had 3 launderettes onboard as I had not seen one on cruise lines other than Carnival previously. My prior cruises on Holland America were on the Oosterdam and Westerdam which did not have the launderettes, but the Veendam is a different ship class so perhaps some of their other smaller ships have them as well. 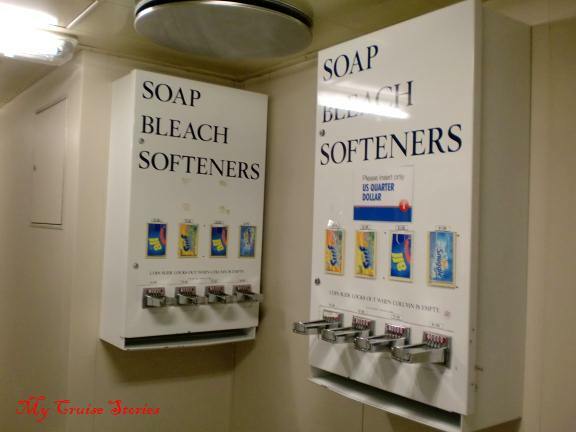 Some other lines such as Princess, Cunard, and P&O also have self-serve laundries on at least some of their ships. On P&O Arcadia use of the washers and dryers was free. 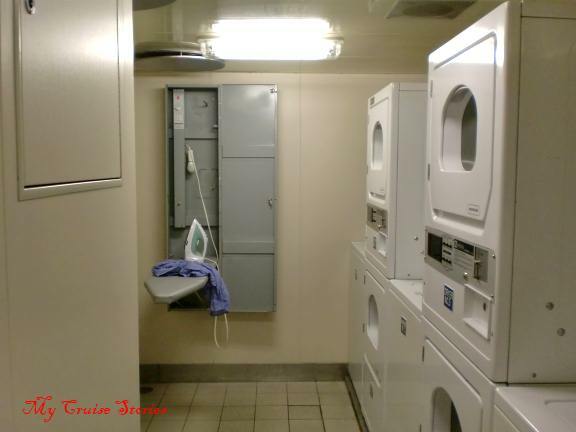 This entry was posted in Breeze, Carnival, Liberty, Shipboard Life and tagged Carnival, cruise, laundrette, laundry, laundry on a cruise ship, travel. Bookmark the permalink. I went to the laundrette on both of my Caribbean cruises only because it was the only place to find a workable iron. Gotta make sure that shirt is pressed for formal nights! At least they have a workable iron to find. They do have the option of paying someone to do your laundry. It’s just cheaper to do your own, so it’s nice that Carnival has that option. 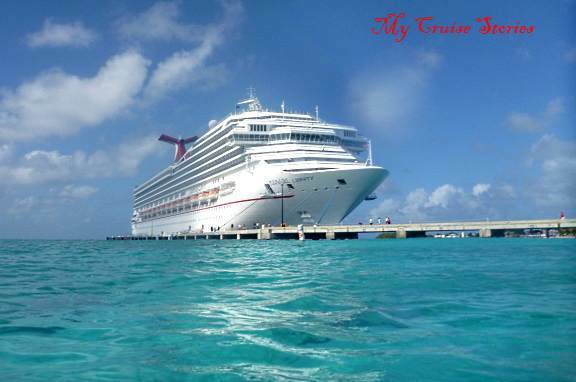 The Liberty is at Grand Turk in the photo, at a private cruiseline owned dock with private beach. Just a short walk down the beach brings you to public areas with shops and bars and locals selling crafts on the beach. Of course the cruise ship private area has plenty of shops and bars too. Good to know. Maybe I should just book a cruise on a ship with self-serve laundry facilities since my neighborhood laundromat is often so busy here in NYC. The fees per item for the crew to do laundry would make enough clothes for one day $15 or more. It’s much better to just do your own if the option is avalible. On ships where it’s not avalible they should be more reasonable and charge by the load not by the item. Laundering by staff is included in my room fee, but I worry as most of my things are handwash cold, drip dry. Would rather do my own, than risk having my nicer things ruined, leaving me stranded for clothes! Can they do dry cleaning too? Some of the suites do include laundry service on some ships, but the regular rooms don’t. 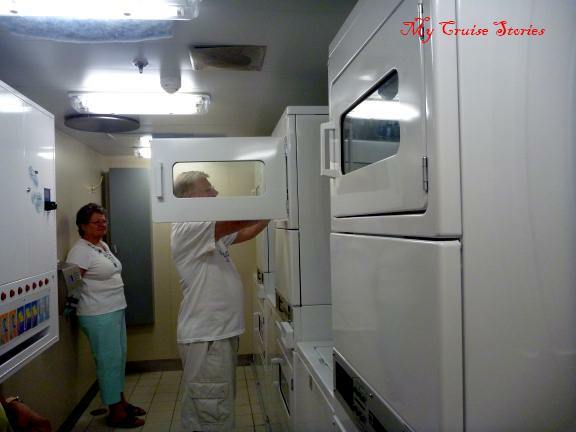 Free laundry service is perk for those who have sailed many times with the same cruiseline on some cruiselines though. Dry cleaning is available on some ships, but not all. There is normally a list somewhere in the room that has the price for each laundry item. I have never had them do my laundry so haven’t paid much attention to those lists, but would assume if dry cleaning were an option it would be listed there. You could also ask the stateroom steward, or the concierge if you are in a suite that has them. You could also find out from the cruiseline before sailing. I have done a bit of handwashing from time to time in the bathroom sink of my cabin. There’s always a clothesline that you can pull across the shower. On a warm day in port I’ve dried things out on the balcony as well. Do you know what decks the facilities are located on? On the Breeze there are full launderettes on decks 2, 7, and 10. There are also ironing rooms on decks 1, 6, 8, and 9.